Did you ever wonder what the nerve inside your eye looks like? You can see a small circular yellow image in the middle of the streak of light in this picture to the left. That is where the optic nerve is entering the eye. Before it enters the eye it is covered with myelin. Myelin acts like the insulation on a wire and speeds the transmission of the signals from the photo-sensitive cells inside the eye to the back of the brain. Myelin is fairly opaque so it stops as the nerve fibers travel to the interior of the eye. 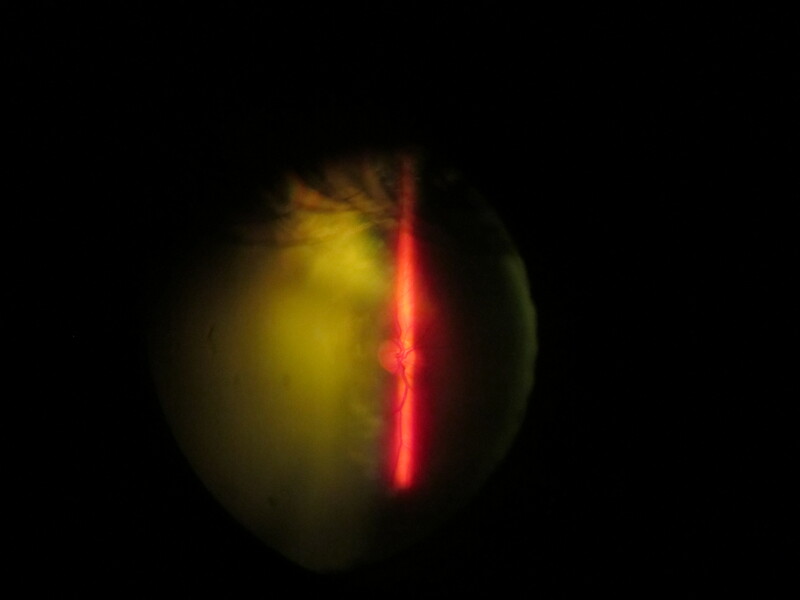 The nerves are arranged in front of the rods and cones and would interfere with vision if they maintained the opacity. 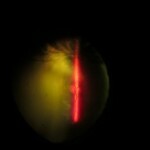 The optic nerve is about 1.5 mm in diameter and carries approximately 1.2 million separate fibers. Imagine trying to connect a wire with over a million strands. The nerve itself creates a small circular blind spot where it penetrates the eye. While your eye doctor can measure this with a visual field testing instrument, the brain completely filters it out. That is fortunate since otherwise everyone would constantly see a dark hole in their vision. The nerve becomes elevated and swollen in some eye diseases and with some tumors of the brain. This can be seen on an eye examination when eyes are dilated. There are blood vessels that accompany the nerve into the eye. The blood vessels provide a view of the health of the entire body. Health problems like high blood pressure create changes in the blood vessels of the eyes that can be detected in vision examinations. It is remarkable when you connect a small nerve under 2 millimeters in size to the incredibly extensive world of vision and perceptions that we inhabit. I lost my right eye sight and I have tunnel vision on my left eye due to brain tumor on 1997 here in U.K. I am 21 and doctors said it happened due to damaged of optic nerve. Now just I like to know are there any treatment to get my eye sight back? Specially the left eye where I got tunnel vision? I would be so much grateful if you please and kindly let me know your best and honest opinion. I honestly don’t think we are quite there yet but I also don’t think we are too far away. I may look into knee treatment for my dog this year, which kind of tells you I think we are getting pretty close. High value racing horses are to my understanding being treated for a number of leg issues an injuries that prevent them from racing. It is not quite the eye, and the risk benefit ratio is much more tipped in favor of doing it (Millions of dollars in winnings and breeding fees tends to overcome some unknown future risks). I would give it a few more years but you probably will want to look into it before it is completely approved due to the extent of your vision loss. The dosn side is you really can’t afford to lose any more sight, and any risk may be unacceptable to you. Hope this helps a little.